Didn’t sleep well last night. Oh are we even allowed to sleep at night during TSW? >.< I itched a lot last night and was hot and sweaty. Think it might be the food I had yesterday. I had toasted sandwiches with beans and a bit of parmesan cheese (my bad). Well now strictly vegan diet again, going to see how that goes. I’m contemplating of getting another week’s of TCM of Dr. Shen’s formula, I think it’s helps draw out the toxins in my system. I’m sweating a lot now and it’s a good thing that my sweat glands are working properly again now. Dr. Shen said it was blocked last time I saw him. I only had 3 weeks of TCM and Dr. Shen said I should be fine now that he has helped me clear up my system and skin shedding off. He told me to go back to him if I wasn’t feeling well but I might just use the last formula he gave me. Blog writing has definitely been therapeutic for me. Since blogging it has given me more hopes and motivation to get thru the days – the very slow TSW days. On bad days I just can’t wait till night time when my babies finally go to bed and husband comes home so I just do jack all! I went to get my dust mite vaccine yesterday and the nurse was very empathetic about my TSW condition and I gave her a list of TSW website (ITSAN and Dr Fukaya’s blog and other names of TSW e.g., Red Skin Syndrome, steroid-induced eczema), and she told me her son has eczema on his face and needs to control it with steroid creams too. I hope he’s not too addicted and she said she’ll let my GP know about this info. I hope my GP does have a look at those journal articles on the ITSAN website. I just took my lil baby in for a nurse 9 month check-up today and prepared a list of TSW sites and info for the nurse as she has been a eczema sufferer too. She was like ‘oh no, maybe i should stop my steroids too’. I hope she doesn't go thru much hell her skin looks very good. I hope I can spread the word as much as I can to help others. It’s depressing going out to face others who are insensitive and they have that ‘OMG look at that freak’ look on their face when they see me. But I know this is temporary and I can use my ugly face to draw attention to others and if they are not scared enough to ask how I am, I can explain to them what is going on and tell them about the dangers of topical steroids. Can’t wait till it arrives and start using it. Tommy got amazing results from it (http://skinofrose.blogspot.co.nz/2013/06/dr-fukayas-skin-repair-lotion-now.html). I hope it really heals my face faster so I can get out of the house more. What's Dr. Fukaya's Skin Repair Lotion? Dr. Fukaya's Skin Repair Lotion (also known as Hyaluprotect in Japan) is made with Hyaluronic Acid of 50000 to 110000 molecular weight, which is proven to effectively hold back the side effects of Topical Steroids such as atrophic skin (skin thinning) and rosacea. 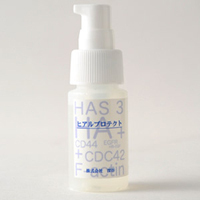 It is an advantage that only Hyaluronic Acid with a molecular weight of 50000 to 110000 dalton has. Most of the Hyaluronan skin care products currently on the market contain Hyaluronic Acid with more than one million molecular weight. Neither this range, nor the low molecular weight 'Super Hyaluronic Acid' (less than ten thousand) has the healing benefits of Dr. Fukaya's Skin Repair Lotion. Dr. Fukaya's Skin Repair Lotion uses only a Hyaluronic Acid of 50000 to 110000 molecular weight in rich 2 % concentration. Dr. Fukaya's Skin Repair Lotion is highly suitable for those of you who regularly use Topical or Oral Steroids and are concerned about its possible side effects. It's also recommended for everyday anti-aging skincare. - Worried about the possible side effects of long-term use of Topical or Oral Steroids to treat skin disorders such as eczema? - Looking for a skincare solution for skin atrophy, fine wrinkles or rosacea? If you are either or both of the above, We recommend Dr. Fukaya's Skin Repair Lotion. If you have eczema and are worried about the possible side effects of using Topical Steroids, Dr. Fukaya's Skin Repair Lotion is perfect as a daily moisturiser. If you are already suffering from the side effects of Topical Steroids withdrawal, it can also help you too. It's presently unknown how a Hyaluronic Acid of middle molecular weight affects skin during this period as there have been no conclusive scientific reports yet. It's often the case that skin during this withdrawal period is hypersensitive to almost everything. However, after a certain period, normally water-soluble moisturiser - such as Hyaluronic Acid - can be applied to skin without adverse reaction. Dr. Fukaya's Skin Repair Lotion is suitable for use during such times. Also, Dr. Fukaya's Skin Repair Lotion is recommended for anti-aging purpose. Hyaluronic Acid with 50000 to 400000 molecular weight is tested to be effective for improvement of skin atrophy and fine wrinkles of advancing age. i have tsw only on my face! so lets ride it out together. i am a bit ahead of you. 4 months going to 5.
i had it worst in month 3. I used the Dr. Fukaya lotion too, it subsided the redness on my face but after few weeks it started to get red again. Must be the flare cycles..we need to get these poison out of our body. we will get there! I am currently on my 3rd day of withdrawal. I have been using hydrocortisone for 3 months everyday on my face because I didn't know it was supposed to be used only short term. My face is super red and its spreading everywhere as my face is damaged. Can anyone tell me how Or what I can use to calm down the red and itchiness? How long does it take to heal ? Please help!